On the anniversary of his birthday I thought I would research the career of arguably Britain’s greatest ever amateur golfer. Indeed many commentators place him only behind the legendary Bobby Jones on the World’s greatest list. 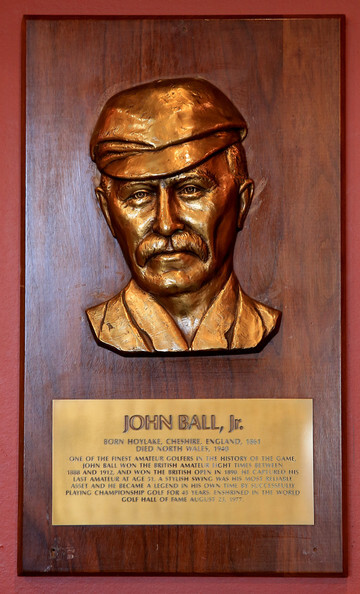 John (‘Johnny’) Ball was born in Hoylake on the Wirral, England on 24th December 1861. John Ball’s father, John Senior, owned the Royal Hotel at Hoylake. The hotel became the club house for the Liverpool GC (the Royal was conferred in 1871) when it was first established in 1869. 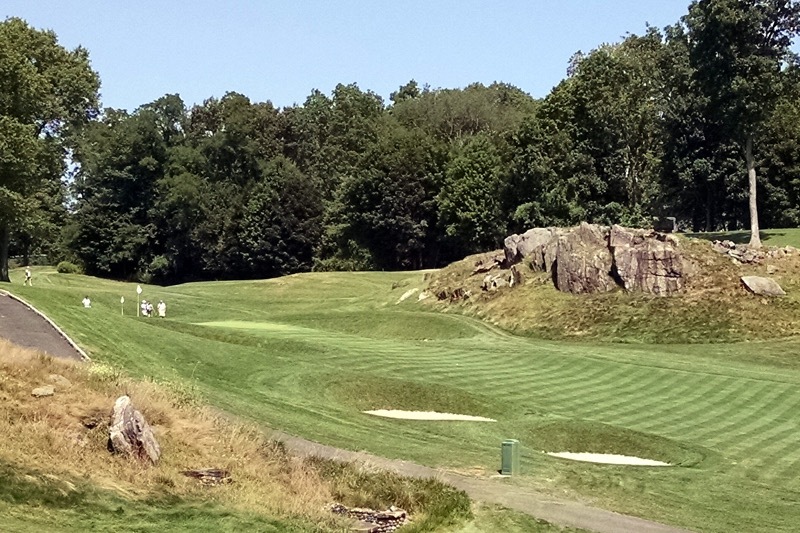 Living adjacent to the famous links (and old race course) John soon took up the game and quickly became proficient. He grew to know Royal Liverpool like the back of his hand. He proved it in 1907 when he took a bet that he could go round the course in a dense fog in under 90 shots, without losing a ball and taking no longer than two and a quarter hours. Playing with a single painted black ball he scored 81 well within the allotted time. He had a natural talent and the most envied swing of the time, despite what Bernard Darwin described as a “curious right-handed grip”. Darwin, the famous Times Golf Correspondent, who saw all of the old greats play in person, thought very highly of Ball, saying “The beauty of any particular player’s style must, like his exact placing in the golfing firmament, be a matter of individual feeling, and I can only say that I have derived greater aesthetic and emotional pleasure from watching Mr. Ball than from any other spectacle in any game”. 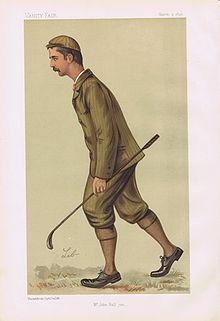 In 1878, aged 16, he came to national prominence when he finished fifth in the Open Championship held at Prestwick GC. The Open, largely aimed at professional golfers, had been inaugurated by Prestwick GC in 1860. In 1885 his home club, Royal Liverpool, held an informal Open Amateur ‘Grand Tournament’, which was played during their Spring Meeting. This match play competition attracted 44 leading players “from recognised clubs” of the time, including Ball (23) who had gained entry through some Committee shenanigans (having received a £1 payment for his Open place in 1878 and whose amateur stays was therefore questionable at the time). In the middle of the competition the stroke play Club Gold Medal was contested. Ball won this with a course record 77. The following morning he played Horace Hutchinson in a titanic semi-final match in the resumed Grand Tournament, losing on the 18th 2 Down. Later that day Allan Macfie beat a spent Horace Hutchinson 7&6 in the final. The event proved to be the success the Club had hoped for and as planned a proposal was put to the Royal & Ancient Golf Club (R&A) for a formal Amateur Championship to be established thereafter. The suggestion was accepted and the first Amateur Championship was staged at St. Andrews in 1886, albeit the 1885 Hoylake Tournament was subsequently recognised in 1922. 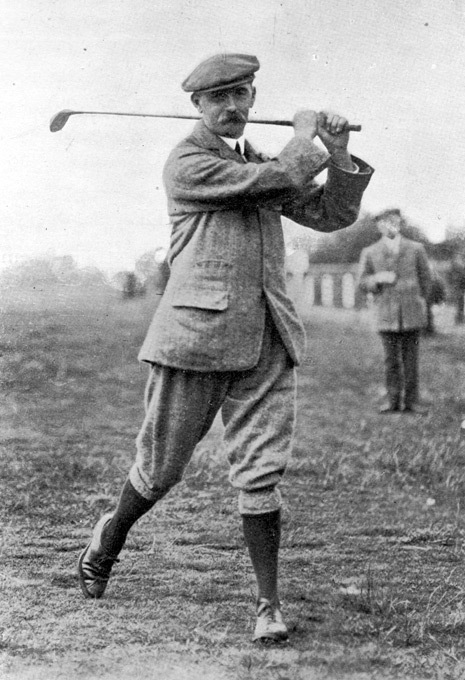 John Ball went on to win 8 Amateur Championships in total – 1888, ’90, ’92, ’94, ’99, 1907, ’10, and ’12. His wins came at Prestwick (2), Hoylake (3), Sandwich (1), St. Andrews (1) and Westward Ho ! (1). His final Amateur victory in 1912 came when he was 50 years old. The gap of 24 years between his first and last victories is clearly a record that will never be broken. He was also runner-up twice, in 1887 and 1895. 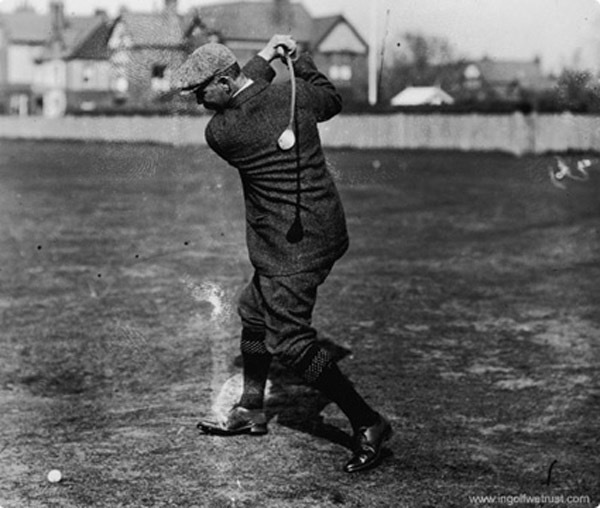 Playing his last Amateur in 1921 at Hoylake, aged 60, he reached the last 16 from a starting field of 223. His Amateur win record of W99-L22 (81.8%) is unparalleled. When one considers Ball was playing in The Open in 1878 (8 years before the first Amateur) and that he also missed the 1900, ’01 and ’02 Championships due to military commitments (see below) one can only hazard a guess at how many Amateurs he may have won if events had unfolded in a more favourable manner. Ball also won the Open Championship in September 1890 at Prestwick GC – only the second time he had played since his 1878 debut. He was the first Englishman and the first amateur to win the Championship. He was also the first to hold both the Amateur and Open Championships – a feat matched by Bobby Jones in 1930 on his way to the Grand Slam. Fellow Royal Liverpool member Harold Hilton is the third and only other amateur to win The Open. He was runner-up in the 1892 Open at Muirfield, when he let a lead slip to his friend Hilton. 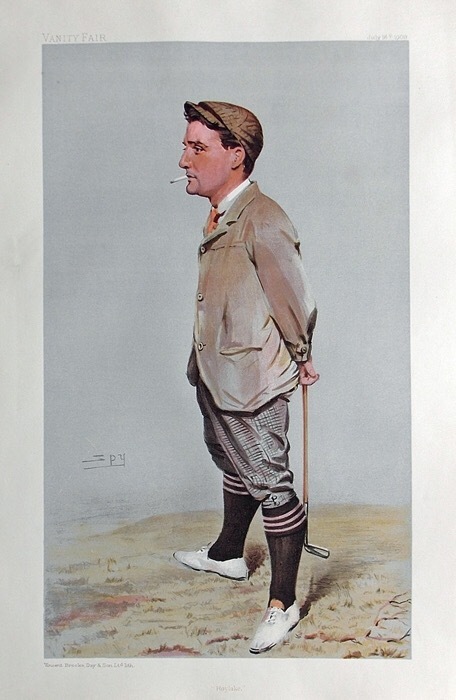 The importance afforded to the Amateur over The Open in these early years is clear when one considers that Ball played in every Amateur between 1885 and 1921, save for his three war years, but was sporadic in his Open entries. Unsurprisingly given his match play record he was a stubborn and determined competitor who would fight to the very end. Darwin once noted that Ball had “a strong vein of hostility and if he wanted a player’s blood, he would fight his way through a tournament with the sole object of getting him”. After his 6th Amateur win in 1907 at St. Andrews he was made an honorary member of the R&A. He served for the Cheshire Yeomanry in the Second Boer War (October 1899 – May 1902) in South Africa. During this period he played next to no golf and missed three Amateur Championships. Indeed one of his fiercest competitors, Scotland’s Freddie Tait, was killed in the same conflict. His later competitive years would also have been impacted by World War I (1915-19) when he served in the Home Forces and most competitions were cancelled. Ball was a quiet, retiring, introverted character who said very little to anyone. It is next to impossible to find any written words or quotes from the great man. He was very modest preferring to let his golf do the talking for him. This approach created a certain mythology around him which remains to this day. The quality of his game meant that he was the first player to consistently go for nearly every flag, whereas his peers simply played for the green. This led to many memorable, heroic shots in his matches which spectators would talk about for days afterwards. It also helped nullify his main weakness which was his putting. He was a traditionalist who fought against the introduction of the lofted iron. He described the niblick (a modern 8-iron), which he refused to carry, as “just another bloody spade” and felt it de-skilled the game he loved. He believed players should simply adjust the lie of their existing mid-iron clubs with their grip when height was required on an approach shot. He retired a ‘legend in his own lifetime’ to a farm in Holywell, Flintshire in nearby North Wales where he eventually died on 2nd December 1940, just shy of his 79th birthday. He was inducted into the World Golf Hall of Fame in 1977. 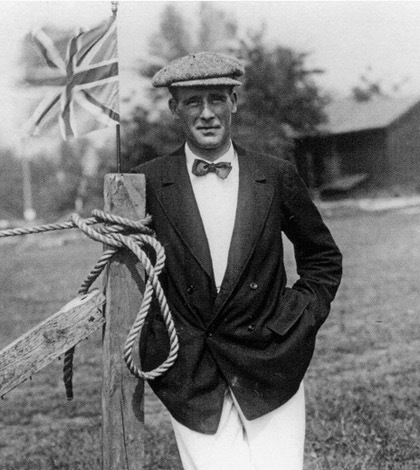 John Ball is a true great of the game who undoubtedly helped spread the popularity of the sport in Great Britain and Ireland in the early 20th Century. He is clearly someone whose legacy should not be allowed to fade away and who should be remembered by us all.